1. I noticed TimeTec Security offers 3 different types of security products in one App. If I am interested in just one type, for example Smart Surveillance, is that ok? Yes. You can purchase just one product, either Smart Surveillance, Smart Lock or Smart Alarm as it can be installed independently. 2. What are the advantages of using 3-in-1 such as TimeTec Smart Lock, Smart Alarm & Smart Surveillance all in one App? Are the device able to interact with one another? Lock, alarm and surveillance products are the most frequently used system to secure and monitor your premises. Due to different working mechanism, you will need to manage and use them separately. TimeTec Security combines all 3 system that eases you in managing your security system as the devices can easily interact with one another. Imagine when an intruder broke into your premise and triggers the alarm system. The Mobile App and alarm system will then alert you about this intrusion and the surveillance system will auto pick-up the intrusion image through its motion detection feature. What’s more, you can also live stream from camera immediately. 3. Is the Smart Security System only suitable for residential areas? Or can it also be deployed as a Smart Office Security System or in a Smart Community environment? A Security System is important for all kind of premises, no matter in home, office or community environment. TiimeTec Security and its components can be installed to secure and monitor your home, and even be scaled up to secure a Smart Office and Smart Community. 4. Does TimeTec Security App come together with the hardware I purchased or do I have to pay in order to download the App? TimeTec Security App is free to download and use as long as you purchase any one type of TimeTec Security products. 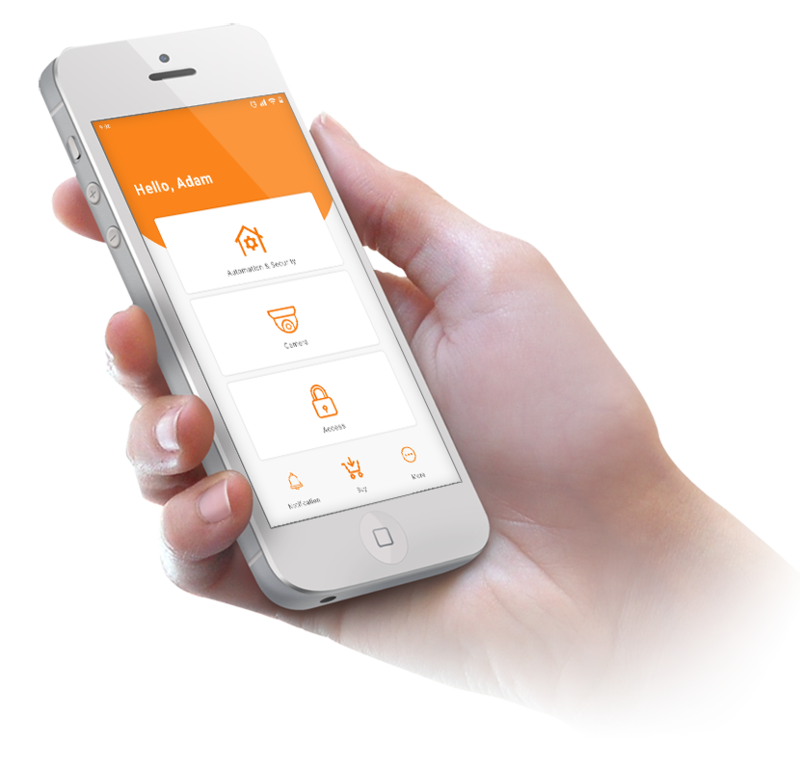 As mentioned previously, you use this all-in-one App to manage and handle the lock, alarm and surveillance system. 5. Will TimeTec Security App update itself from time to time? If so, do I need to pay for the upgraded version? We will bring new features to the Mobile App from time to time. And the best part is that the upgrade is always free. 6. How long is the standard warranty period for your smart security product series? We offer 3 years manufacturer warranty to end users. 7. Shall I register the purchased items? On your web page? Or from the App? You can use your email address to register an account at TimeTec Security App. Note that every time you add and activate the purchased item into TimeTec Security App, the product warranty registration will be completed at the same time. Thus you do not need to register the warranty at any particular web page, unless you want to register your purchased item before using it, then you can go to http://www.fingertec.com/ver2/english/e_warranty.htm for registration. 8. How do I claim my warranty if my purchased item is faulty? You can report to your local vendor, and he/she will proceed to claim the warranty from us. 9. Can I install your Smart Security Series all by myself, in other words: DIY? “We Make Things Easy” is our motto, and we designed our products to achieve Do-it-Yourself (DIY) concept at its very best. Unfortunately, not all products can be installed without some skills. For example, the Smart Surveillance camera such as E17S requires you to seek out an expert in order to help in the installation process. What’s more, the installation of Smart Lock will also require a professional workman as some minor cuttings/modifications will need to be carried out on the doors. 10. Does your Smart Security Series require subscription fees, or is it just a one-time-off-the-shelf purchase? All of our Smart Security products can be purchased one-time-off-the shelf. But to achieve better Internet-of-Things (IoT) capability, customers have the option to subscribe to cloud storage and store the surveillance images on our cloud server for surveillance products. 11. How long will the data be kept in your cloud server? By default, we will keep one year logs/records for the Smart Lock (door unlock activities, system setup/changes) and Smart Alarm. Note that you can also pay a minimum fee to extend the storage if required. As for the Smart Camera, you can also store the video into its SD card (inserted into the camera) as well as upload and store the video into our cloud server (optional). You can refer to https://www.epicamera.com/pricing for the detailed charges of different storage size. © 2019 TimeTec Nuvem Sdn.Bhd. Todos os direitos reservados.